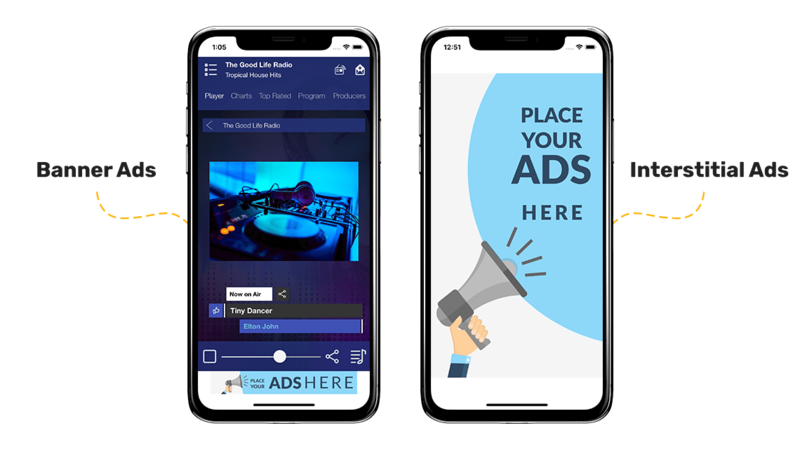 A mobile banner or banner ad is an image intended to promote certain events, products & services or simply to attract the attention of your mobile app users. In which plans are mobile banners available? Looksomething provides you with the opportunity to add your own images by subscribing to our Enterprise & Network plans. Moreover, if you purchase the Google AdMob/ MS Adds Addon, you can monetise your mobile app by displaying Google or Microsoft Ads in it. Please note that mobile apps in Starter plans include our own Google Ads whereas apps in Business plans do not display any ads at all. Where can I place banners on a mobile app? Interstitial are full-screen ads that are displayed for some seconds when your mobile app is launched. You can add as many Interstitial ads as you want; however, only one will be displayed each time your mobile app launches. Nevertheless, all of them will be automatically rotated in order to be served equally to your mobile app users. The recommended dimensions for interstitial ads are 850 x 1500 pixels. On the other hand, banners are displayed in the bottom of the screen for as long as the app is active. Again, feel free to add as many smart banners as you want; they will be displayed in sequence. The recommended dimensions for smart banners are 640 x 100 pixels. Please mind, that mobile banner positions are fixed and cannot be altered nor increased in number. However, you can choose not to display any banners at all. Visiting Banners you can create, manage & edit all your mobile banners quickly and efficiently. The interface is simple, allowing you to easily have a view of all your banners (total impressions, clicks & click-through rate) or sort them in any desired order. Moreover, you can optionally set a starting and finishing date, a maximum impressions limit and their own URL. Supported image formats include .gif, .jpeg and .png. You can visit our relevant article in order to find out how you can upload and manage files within the control panel. Note that you need to make sure your image name does not contain any spaces or special characters. Last but not least, banner ads can be optionally assigned to clients (created in banner categories) allowing you to group banner ads according to your liking. How can I set up Google AdMob or MS Ads on my mobile app? To begin with, you need to make sure that you are currently subscribed to Enterprise or Network plan and that you have Google AdSense/ Microsoft Ads Addon enabled in your subscription. Creating a Google AdSense/ Microsoft Ads involves signing up in Google's and Microsoft's relevant platforms, creating Ad Unit IDs and setting up your bank accounts so that you can accept payments from Google and Microsoft respectively. Next, you need to contact us and provide those IDs so that we can add your ads to your mobile app. The above process is fully described here. The following video tutorial demonstrates how you can create mobile image banners using your Admin Control Panel.